ICS Components welcomes your requests for customized product development or modification based on our standard products and will do our best to meet your technical, commercial needs as well as economy of time. Our professional process by Technical Sales Team will grant your request with the most satisfactory proposal within 10 working days. 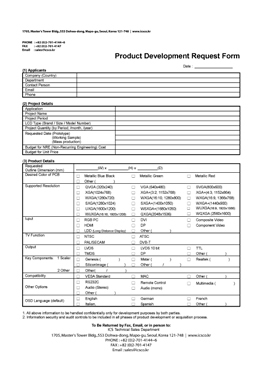 Please fill out our Development Request Form and send us back by E-Mail or Fax as below.